College Park, Maryland: August 6, 2006: Maryland Web Designers Corporation., one of the fastest growing local Web development companies in the State held a series of Web teaching sessions for the University of Maryland at College Park’s Public Safety Department and IT department. "The sessions were designed to teach, educate and coordinate the UMDPS Officers as well as the Department’s IT staff on the usage and importance of their website as a communication tool, not only for the department as a whole but for the entire College Park Community, giving them the ability to update and customize their Website in-house at the touch of a button," said Michael Berkman, CEO and Founder of Maryland Web Designers Corporation. The seminars took place at the UMCP Campus in June and July 11, 2006. 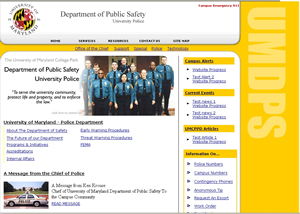 The University of Maryland, College Park's Department of Public Safety's website was deployed at the end of 2005. The website is maintained almost entirely in house- effortlessly through the development of Maryland Web Designers Corporation. Proprietary back-end website administration tools. These tools were designed to provide site wide or global update capabilities to the Administrators at the UMDPS, through a simple to use web-based administrative control panel. In addition, to global update capabilities the department needed to be able able to update certain sections of the website in a workgroup environment. Macromedia's Contribute was the tool of choice. Maryland Web Designers Corporation. Implemented, trained, developed procedures and provided documentation to the Department of Public Safety to successfully complete this project. "This is a unique Web publishing system that enables individuals to publish directly to a Website in a workgroup environment, using tools very similar to MicroSoft's Word, making a site’s content live, format able and up-to-date. The system not only empowers a company’s employees with the ability to make immediate changes, but it enhances the effectiveness of the company’s internal communication, while maintaining the website's design." Macromedia Dreamweaver 8 is a Web development tool that enables users to efficiently design, develop, and maintain standards-based Web sites and applications. Dreamweaver 8 allows companies to update their own Web sites using a customized program that specifically meets each company’s individual needs. Mr. Berkman goal at the UMDPS was to teach the Department of Public Safety and it's IT Department the basics of Dreamweaver 8 & Contribute, thereby empowering them to create, maintain and design their own Website, customize new updating procedures, as well as implement and design basic maintenance tools, and improved administration applications. "Having a good and solid knowledge of these programs can save companies a lot of time and money. Empowering a company with the skills to use these extremely useful Web development tools gives them a self-reliance that is immeasurable," explains Mr. Berkman. "With these tools you simply do not need to rely on outsourcing basic Web design and development services." Maryland Web Designers Corporation. is a full service Web site design company specializing in designing creative, original, clear, and easy to navigate Web sites that enable companies to stand out among their competition. Maryland Web Designer’s Inc., provides a full range of professional Web services that together can meet all of your Web presence needs. Our services include: Web design; Brand name/logo development/domain name purchasing; Web hosting; Web marketing; and Web maintenance. Serving local, regional, and national clients for over eight years, Maryland Web Designers Corporation. is a reliable, consistent, service-oriented Web site design company. For information on scheduling an informational seminar with your company, call Maryland Web Designer’s, Inc. at 410-404-0663 or .